A caring funeral home that serves bereaved families in Dunfermline. Excellent staff and service, kind and caring throughout. Very professional and understanding to my needs,they made the whole experience a lot easier to get through. This funeral home in Dunfermline is proud to be a part of Scotland’s largest independent co-operative, with a rich history spanning over 150 years. Scotmid is proud to be at the heart of the local communities it serves, with its Dunfermline office. The office can be found at the corner of Bridge Street and Bruce Street, opposite the Dunfermline registry office. There is parking available in the nearby supermarkets, and also in the Pittencrieff Park. 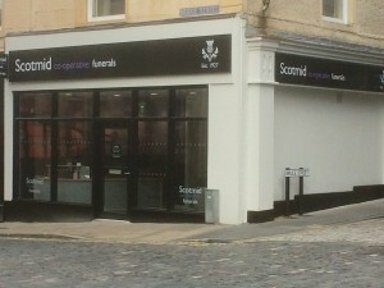 Scotmid Funerals, Dunfermline will provide you with a free obituary as part of their service.